The Vortex generator that maximizes your fuel mileage! 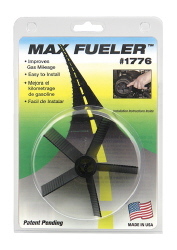 The Max Fueler is a breakthrough in performance enhancing technology. Its simple design allows for easy installation and lasts the life of the vehicle. By generating a vortex of air in your vehicle intake, the Max Fueler allows the engine to breath more efficiently, increasing gas mileage. Features and Benefits: Improves gas mileage, Average fuel savings is 1-3 MPG, Fits almost all fuel injected vehicles, Never needs to be repaired, Trim able blade trips, High impact nylon, Easy to install, Fits 2" (50mm) to 4" (105mm) intake openings, No special tools required, No moving parts, and will not void warranty. Not Bad for a 14.95 Investment!!! !